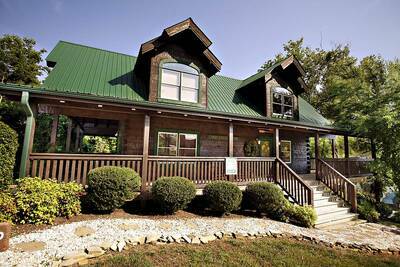 Welcome to A Peaceful Getaway in Pigeon Forge! 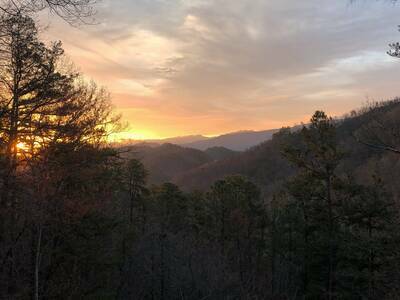 This amazing 3 bedroom, 2 bath Smoky Mountain vacation getaway is located less than a mile and a half from the main Pigeon Forge Parkway with no mountain roads to climb and easy paved road access. 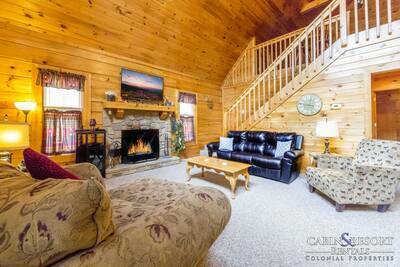 The main living area of A Peaceful Getaway is wonderfully appointed with cozy mountain decor, cathedral ceiling, a stone accented fireplace and access to the full length screened porch. The open floor plan into the fully equipped kitchen and adjoining dining area ensures that everyone can enjoy each others company. The main level also features a bedroom with queen bed and full bath. Head upstairs and you are greeted by the entertainment room. Here you can watch your favorite movies, sports game or TV show. If that's not enough to keep everyone happy, be sure to test their skills on the air hockey table. Just outside the game room is an open deck with a 6-8 person hot tub overlooking the forest below. Upstairs you will also find the luxurious master suite. You'll absolutely love the spaciousness of the bedroom and nearby jetted tub - a perfect spot to relax after a day/night in town. This bedroom suite also has it's very own private deck access. There's also an additional bedroom with queen bed and bath located on the upper level. Being outdoors at A Peaceful Getaway is a real treat! From the expansive wrap around deck to the full length screened porch, you will love every minute of relaxing and enjoying the fresh mountain air while being outside. Some other great features you're sure to enjoy are complimentary high speed internet access and seasonal swimming pool access. If you want to be in town, near all of the attractions - Dollywood, The Island & Parkway - then A Peaceful Getaway is the place to be. It's the perfect place to enjoy car shows, parades and all of the great things to see and do in Pigeon Forge. 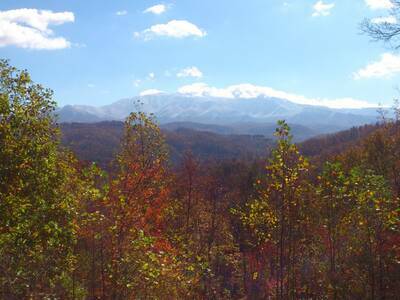 Reserve an amazing Pigeon Forge vacation today at A Peaceful Getaway! A: Dogs only up to 25 pounds. A non-refundable pet fee of $50 (for each dog / limit - 2 dogs). A: Hi Joellen! Yes, A Peaceful Getaway is a pet friendly property. A: Hi Rhonda! There is a Queen Bedroom on main level with full bath across the hall. A: Hi Ricky! A Peaceful Getaway per Fire Marshall Regulation can only accommodate 8 people. A: Hi Melissa! It is open May - September. It could open sooner and stay open later, weather permitting. A: Hi Darrell! Yes there are. “ The cabin was GREAT! My husband was in a wheelchair and the downstairs(entry level) was perfect. It was open and accessible to bathroom and lower bedroom. It was a great weekend! “ We really enjoyed our stay. The cabin was in tip top shape. The staff was very courteous and helpful. The best part of the trip was going into town and sampling the Moonshine. I would definitely recommend this to friends and family. “ Our cabin was very comfortable and we really enjoyed our stay. We were able to watch the fireworks at Dollywood each night from the Master bedroom balcony. This was a special treat. The location of our cabin was excellent, close to everything in Pigeon Forge. We look forward to staying here again. “ very pleasant and lots of space, has a great outdoor swimming pool. 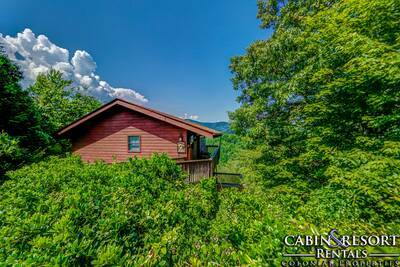 “ We loved our cabin and the convenience to all the attractions and the mountains. Lots of privacy and it had everything we needed. Very peaceful and relaxing. A great place to spend 44th anniversary. “ We loved our stay at this cabin. Everything was perfect. The cabin amenities were great, and it was very conveniently located. We are looking forward to another stay in the area and would love to get the same cabin again. “ EXCELLENT! Property was exactly as described! Checking in was a breeze. We had a TERRIFIC week! “ This was our 1st time coming and my family and I really ENJOYED OUR PEACEFUL GETAWAY! 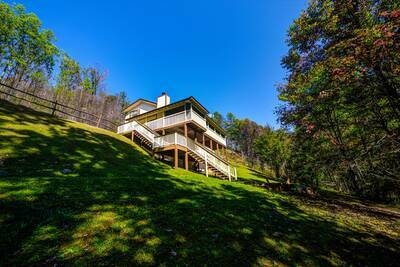 “ The location was great and the decks were very nice to enjoy the beautiful mountain views. “ I really enjoyed my time in Tennessee and the cabin was perfect. I met a few people that were staying in the other cabins and talked about how beautiful it was. I hope to come again next year. Thank you for making the stay comfortable and peaceful. “ We had a wonderful time with our family. We got married in the cabin. We made many memories and will return to the cabin"the peaceful get away" Thanks for the Wonderful stay and cleanliness. 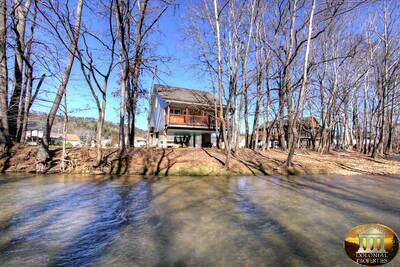 “ Great cabin and great location!